I had the pleaseure to give this morning a presentation on Top 10 Consumer & Tech Trends at IHECS in Brussels. Coming from an FMCG company (11 years at Unilever) and working now at Microsoft for 5 years, I’ve a good feeling of what’s important for the consumers (their needs) while I observe how the consumers are consuming new technologies & media now and how it could change in the Future. In 1960, a concept was introduced by E. Jerome McCarthy that identified the four basic tenants of marketing as Product, Price, Place, and Promotion or, as it is more commonly known, the 4 Ps. Based on that, I can confirm you that the world is changing fast and that the world won’t never been the same. While the 4 P’s offer a good basic framework for understanding the all encompassing nature of marketing, They are missing one key ingredient that has been made apparent by the consumer revolution – the consumer’s involvement in the process. While the way consumers adopt new technologies and consume media, is changing, I can personally observe that many marketers have not changed. The consumer is now in the driving seat ! This has a huge impact on the way we should interact with them as the consumer becomes a medium itself. There are some decision takers and marketers who are declaring the 4 P’s dead, or at least no longer relevant. They, and I’m part of them , dare to say that the four P’s are DEAD ! There are other marketers who don’t change and continue to apply old principles. But what are the main drivers for change ? The age of interactive information has turned the four P’s on its head. Indeed, the adoption of new technologies has never been so fast : 38 years to get the first 50 Millions users of TV while it took only 9 months for the first 100 Millions users on Facebook. 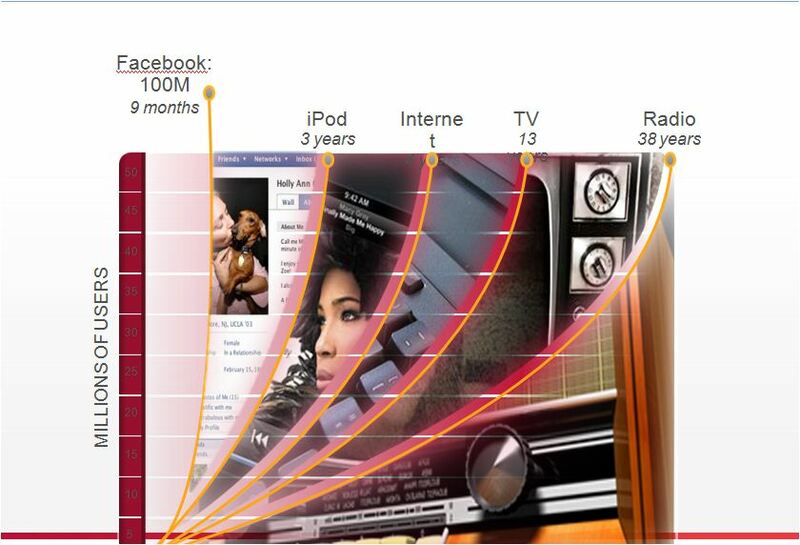 See following slides showing how fast is the adoption of new technologies. 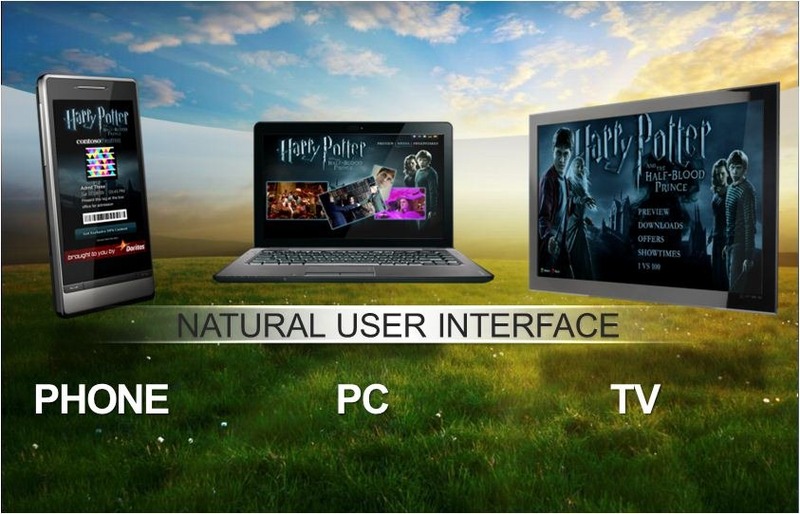 This adoption of new technologies is driven by the digitalization of everything (music, picture, movie,…) The consumers want to consume this content on every devices (PC, TV, Smart Phone, Slate, …) while the content in is the CLOUD. This is the vision of Microsoft. The speed of transactions is faster, more dynamic and happening real time. The world is moving into a more demand-based view. Customers are exposed to large amounts of ads every day. So how do you make your product stand out and above the rest? On-top of that, as you can see here-below, the world of advertising has changed since advertising’s glory days in E. Jerome McCarthy’s 1960s, in the way we should interact / dialogue with the consumers. 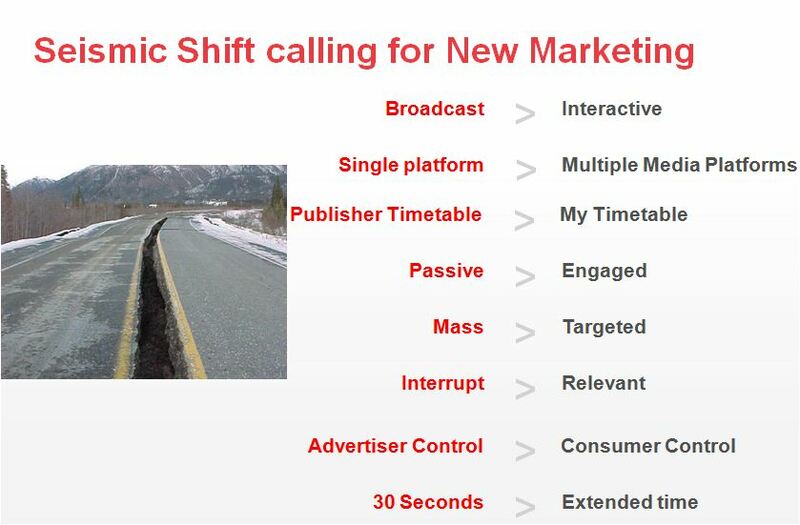 We can observe following evolution (from broadcast / mass marketing to interactive / targeted marketing) as you can see on my slide here-below. As Seith Godin would say, there is an evolution from interruption marketing to permission marketing. What’s interruption marketing ? Imagine it’s later in the day at the same airport. You’re late for your flight, and someone asks you the same question. Will you give him the same attention? Finally, a third scenario: You’re late for the flight, the airport is crowded, and this is the fourth person to ask you the same question. What are the chances you will pay any attention at all? You’re probably going to even develop a strategy for avoiding further interruptions –not making eye contact, brushing them off, refusing to help. What’s permission marketing ? Permission marketing is the privilege (not the right) of delivering anticipated, personal and relevant messages to people who actually want to get them. Real permission works like this: if you stop showing up, people complain, they ask where you went. There are many marketers who have even added more P’s to the mix, such as people, process, physical presence, or (as the word-of-mouth/social media crowd like to say) participation. The principle is that you need to customize your product and/or your story telling to suit each customer’s needs. As the consumer is the MEDIUM thru social Media, your value proposition and your story telling should be Unique & Simple so that they will be your best Ambassadors. From Product to Co-created solutions and experiences. Work with the customer to captivate and engage them. From Promotion to Communication with communities. Customers want interconnected. interactions with like-minded people not just information. Social communities are the new-age promotion channel. From Price to Customisable personal value. Give each individual customer something that they want and suits them. From Place to Choice and convenience. Make sure your product can reach your customers. Use the internet and be online 24/7. Work with customers to create products that they want. Go online and create a group on a social network site about your product or business. Give the customer more choices of your product whether it be colour, shape or size. Get you business operating 24/7 worldwide – make a website where customers can buy your products. Build your products so customers can customise it to suit their budget. The customer is no longer the object of a sale, selling a service, or the subject of some department loyalty scheme. You as a business owner must capture what is important to the customer and understand the shift from the 4 P’s to the 4 C’s. I also believe you have to dare to create something unique and remarkable. In his book called “Purple Cow”, Seth Godin explains how Transform Your Business by Being Remarkable. In this book, Godin urges you to emulate companies that are consistently remarkable in everything they do, which drives explosive word of mouth. Source : from Rohit Bhargava. James Rogers, Professor at Earlham,Richmond, postet his list of six top tech trends for 2010. Cloud services offer computer power or data storage via the Internet. Cloud computing has been one of the tech sector’s biggest catchphrases of the last couple of years. IDC estimates that the Chinese IT services market grew from $7.7 billion in 2007 to $9.5 billion last year, and is expected to experience a compound annual growth rate of almost 14% between 2008 and 2013. Economic Observer News estimates that around $53 billion of China’s $585 billion economic stimulus package will be spent on technology projects, something that has certainly grabbed attention on the other side of the Pacific. This will be a hyper growth area. Green technology will be big business in 2010, hitting everything from smartphones to servers to storage devices. Tablets will be the new communication entry point. Virtualization will be even more delpoyed in 2010 and continously penetrate IT infrastructure. TOP 10 trends for 2010. Take a look at these ten consumer trends that will inspire you to introduce new products and services over the next 12 months. 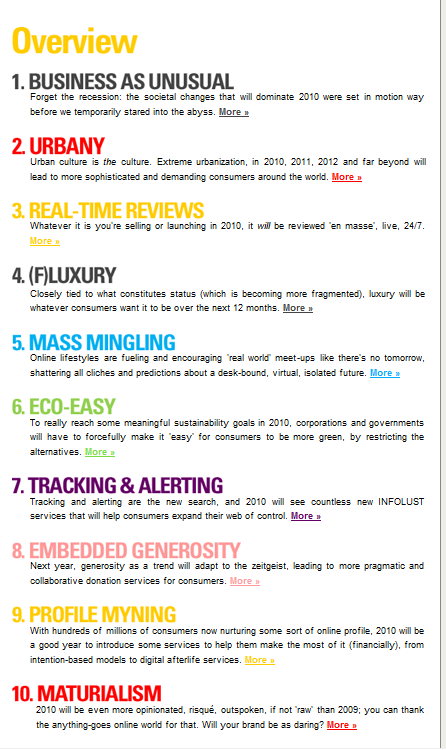 Here-below, an overview of these TOP 10 trends for 2010.